Three new complex borate compounds K7CaBi2B15O30, K7CaLa2B15O30 and K7BaBi2B15O30 have been synthesized by the high-temperature solution method. K7CaLa2B15O30 and K7CaBi2B15O30 crystallize in the chiral trigonal space group R32, while K7BaBi2B15O30 crystallizes in the noncentrosymmetric orthorhombic polar space group Pca21. All of the title compounds have similar three-dimensional crystal structures, which are composed of isolated B5O10 groups and LaO6 or BiO6 octahedra, and K+, Ca2+, and Ba2+ cations fill into the cavities to keep charge balance. Based on our research, in the system of K7MIIRE2B15O30 (MII = Ca, Sr, Ba, Zn, Cd, Pb, K/RE0.5; RE = Sc, Y, La, Gd, Lu, Bi), K7BaBi2B15O30 is unique and crystallizes in a different space group, which enriches the structural chemistry of borate. Detailed structural analyses indicate that the structural variation is due to the difference in size and coordination number of the alkaline-earth metal cations. Besides, UV-Vis-NIR spectroscopy analysis and the second-harmonic generation (SHG) measurement on the powder samples show that K7CaBi2B15O30 exhibits a UV cutoff edge (about 282 nm) and a moderate SHG response (about 0.6 × KDP). In addition, thermal analysis and infrared spectroscopy were also presented. To better understand the structure-property relationships of the title compounds, the first-principles calculations have been performed. Zhiqing Xie received his BSc degree in Nanshan College in 2015. Now, he joined Professor Shilie Pan’s research group as a master student at Xinjiang University. He is currently focusing on the optical materials. Ying Wang received his BSc degree in applied chemistry from Peking University in 2009. Under the supervision of Professor Shilie Pan at the University of Chinese Academy of Sciences (UCAS), he completed his PhD in material physics and chemistry in 2015. In the same year, he started his independent career as an assistant professor at Xinjiang Technical Institute of Physics & Chemistry of CAS (XTIPC, CAS). In 2017, he was promoted to associate professor at XTIPC. His current research interests center on optical materials. Shilie Pan received his BSc degree in chemistry from Zhengzhou University in 1996. He completed his PhD under the supervision of Professor Yicheng Wu (Academician) at the University of Science & Technology of China in 2002. From 2002 to 2004, he was a post-doctoral fellow at the Technical Institute of Physics & Chemistry of CAS in the laboratory of Professor Chuangtian Chen (Academician). From 2004 to 2007, he was a post-doctoral fellow at Northwestern University in the laboratory of Professor Kenneth R. Poeppelmeier in USA. From 2007, he worked as a full professor at XTIPC of CAS. His current research interests include the design, synthesis, crystal growth, and evaluation of new optical-electronic functional materials. 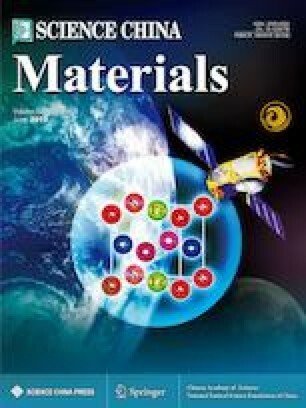 Supplementary material is available for this article at https://doi.org/10.1007/s40843-019-9412-5 and is accessible for authorized users. 本文采用高温熔液法合成了三种新型复合硼酸盐化合物K7CaBi2B15O30、K7CaLa2B15O30和K7BaBi2B15O30. K7CaLa2B15O30和K7CaBi2B15O30结晶于三方手性空间群R32中, K7BaBi2B15O30结晶于非中心对称正交极性空间群Pca21. 这三个化合物具有相似的三维晶体结构, 由孤立的B5O10基团和LaO6或BiO6八面体组成, K+、Ca2+、Ba2+阳离子填充于空隙中以保持电荷平衡. 根据我们的调研, 在K7MIIRE2B15O30体系内((MII = Ca, Sr, Ba, Zn, Cd, Pb, K/RE0.5; RE = Sc, Y, La, Gd, Lu, Bi), K7BaBi2B15O30是唯一一个结晶于不同空间群的化合物, 其丰富了硼酸盐的结构化学. 详细的结构分析表明, 碱土金属阳离子的尺寸和配位数的差异是导致结构变化的主要原因. 此外, UV-Vis-NIR光谱分析和倍频效应(SHG)测试表明K7CaBi2B15O30具有较短的截止边(大约282 nm)和适中的倍频效应(约0.6×KDP). 我们还进行了热重差热和红外光谱的测试. 为了更好地理解上述化合物的结构性能关系, 我们还进行了第一性原理计算. This work is supported by the West Light Foundation of the CAS (2016-YJRC-2 and 2015 XBQN-B-11), the National Natural Science Foundation of China (51602341 and 91622107), the Natural Science Foundation of Xinjiang (2016D01B061), Tianshan Innovation Team Program (2018D14001), and Key research project of Frontier Science of CAS (QYZDB-SSW-JSC049).